Scarborough Jazz Festival September 28 - Evening. Collins (tpt/flg); Allen (ten.sop); Ross Stanley (org); Enzo Zirilli (dms). A powerhouse set with blistering tenor from Allen, cool fully toned trumpet and flugel from Collins, mighty organ and bass pedals from Stanley and more impressive drumming from the man from Torino. A program of originals by both front line men that ranged from the boppy opener What's it Gonna Be? to the closing number - another quizzical one - Why? In between there was Beauty in Quiet Places with mellow flugel horn, Oscar's Lullaby - dedicated to one of the leaders' young child, The Paw of Discontent - dedicated to one of the leaders' - I forget which one - cat, Dark Shadows which was inspired by Hammer movies and Teeth For Two based on a tune of a similar name. Superb opener to the evening. A Tribute to Bill Evans and Scott La Faro - Scarborough Jazz Festival Friday September 28 Afternoon session. Gareth Williams (pno); Dave Green (bs); Enzo Zirilli (dms). This follows on nicely to Russell's review of the Paul Edis Trio's Bill Evans tribute at Hexham last night. The main difference between the two was that whereas Edis concentrated on Evans' original pieces, Williams - with the exception of Waltz For Debbie which has become a standard anyway and La Faro's Glorious Step - chose to work on Evans' standard repertoire. Both were brilliantly done - I'd seen the Edis version prior to the Hexham gig. Paul went into greater biographical detail - not all of which we wanted to know whereas Williams concentrated on the musical aspects of his life. On bass Dave Green was as dependable as ever proving to be the perfect "Scott La Faro" whilst on drums Enzo Zirilli filled the Paul Motian role. Williams himself played a lot of piano - at times more than Evans played yet still capturing perfectly the mood. Just as George Shearing's chords are easily identifiable so are the harmonic clusters of Evans. For the record titles played included; What is This Thing Called Love? My Foolish Heart (the song that first got Williams hooked on the flawed genius), Waltz For Debby, Young and Foolish, Autumn Leaves, Spring is Here, The Theme from Mash (Evans' favourite tv program), Come Rain or Come Shine, Someday my Prince Will Come and My Romance. A great start to the Festival with more to follow in the evening. Paul Edis Trio: The Music of Bill Evans @ Queen’s Hall, Hexham. September 27. The Exchange Café in Hexham’s Queen’s Hall Arts Centre attracts the Guardian reader, the novel reading couple (each reading a different title – now that’s what I call a good night out), the coffee drinker and the beer drinker. The latter, initially disappointed at the absence of a hand-pull, took solace in a small selection of bottled beers (at Guardian reader prices) behind the bar. The house beers, supplied by the Tyne valley’s micro brewery up in the hills at Allendale, included APA (Allendale Pale Ale, 5.5%). It proved palatable. A good number of Arts Centre patrons settled down for an evening of jazz (next week they will get along to a folk gig, the week after a string quartet will tempt them to have a run out in their Tyne Valley Tank - aka 4x4). Redemption Jazz @ Hoochie Coochie. Friday Sept. 27. Redemption Jazz don't take prisoners - they go for the jugular from bar one. That they do it in a contemporary manner whilst still retaining the basic ingredients of jazz (and music) is very much to their credit. They swing, they get a groove going, at times the intensity is almost unbearable until they bring you down - sometimes you don't want to be brought down! Jazz North East's next three gigs practically constitute a multi-national mini festival within our Firing the Furnace autumn programme : three concerts in six days at the Central Bar, Gateshead ; the Newcastle Lit & Phil ; and the Bridge Hotel, Newcastle. 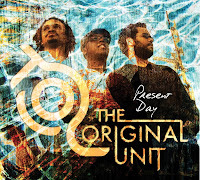 Two, Irene and Sons of Kemet, are badged 'On the Outside' i.e, gigs at the more experimental/adventurous end of jazz. 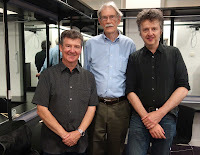 The third, Christoph Stiefel's Inner Language piano trio, is rhythmically complex but is otherwise straightahead, won't - scare - the - horses contemporary jazz - similar to Benjamin Moussay's enormously popular French piano trio which we promoted at the Lit & Phil in 2011. 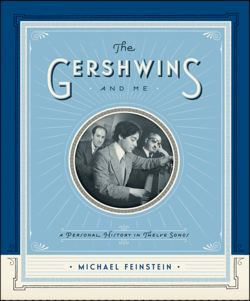 George and Ira Gershwin were, arguably, the greatest of the classic song-writing teams and the finest archivist, historian and authority on their work is without doubt Michael Feinstein who is no mean performer himself both as a pianist and singer. I guess Michael probably knows more about the Gershwins than they knew about themselves and it is therefore inevitable that he should be the author of a book about the brothers that relates their lives in the context of 12 of their songs. Strike up the Band, Love is Here to Stay, S'Wonderful, Fascinating Rhythm are just some of the classic Gershwin songs that head each chapter of the 352 pages. As a taster, read the chapter headed Strike Up The Band. Listen to Feinstein singing, S'Wonderful. YouTube him doing Love is Here to Stay - the brothers' last collaboration. The book, along with a CD by Feinstein is published on October 16 and will be a worthy addition to the bookshelves of those with a love of the GASbook and the Great Composers within its (The GASbook's) infinite pages. The Gershwins and Me by Michael Feinstein is published by Simon and Shuster on Oct. 16, 2012. Jazz North East and Schmazz pooled meagre resources to bring Ken Vandermark to town. 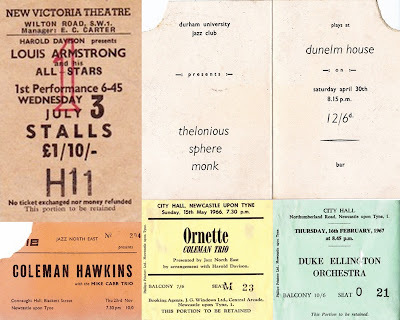 The Chicagoan had visited Tyneside on several occasions and this most recent visit came about through the efforts of bassist Olie Brice to put together a few dates to make it worth while crossing the Atlantic. The turn-out at the Cluny was encouraging including a smattering of students keen to hear the American free jazz reeds maestro. Vandermark played tenor and baritone (perhaps having the edge on tenor) and some impressive high-register clarinet. 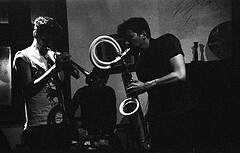 The set with the British bass and drums pairing of Olie Brice and Mark Sanders worked as well as any Vandermark combination previously heard on Tyneside. A cast iron technique enabled the American to immerse himself in the music-making. Full throttle tenor and circular breathing clarinet playing drew considerable applause from a most attentive audience. Bassist Olie Brice created infinite figures and drummer Mark Sanders produced perhaps his finest performance (of many) on Tyneside. Next month at the Cluny (Tuesday 30 October) Schmazz presents the superb trio Watson Walker Edis (Lewis Watson – reeds, Rob Walker – drums and Paul Edis – keyboards). Billy Barnes may not be a name that is over familiar to jazz fans but it should be! Barnes composed the title track for the immortal June Christy album Something Cool. A charismatic piece that tells the story of a woman bending the ear of a stranger in a bar whilst drinking "Something Cool." Its enigmatic - has she really fallen so far from grace, or does she just have a drink infused imagination? Barnes also wrote Have I Stayed Too Long at the Fair? for Barbra Streisand. Billy Barnes died on Sept. 25 aged 85. Book Review: Road Rat's Tips. 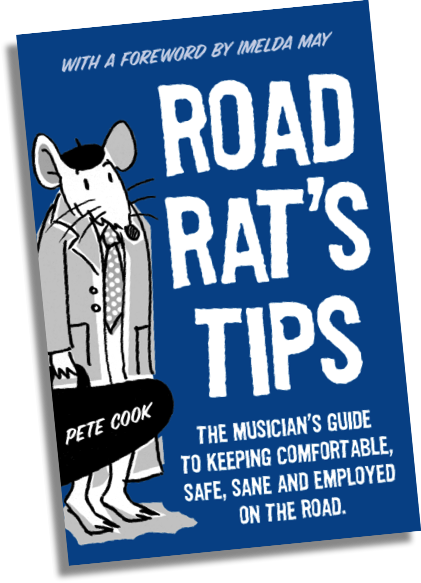 The musician's guide to keeping comfortable, safe, sane and employed on the road - by Pete Cook. 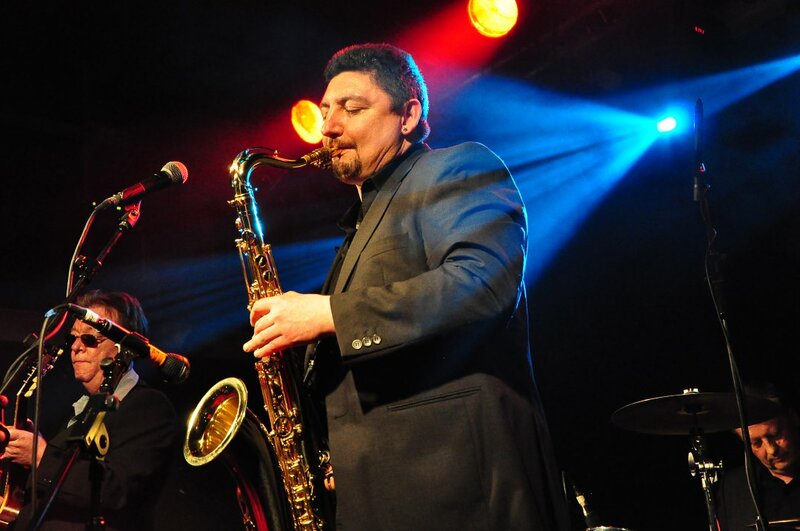 As well as having been a pro sax player for 20 years, Pete Cook is also Head of Jazz at London College of Music. With such a pedigree it's little wonder that Cook is able to mix in a wealth of anecdotes alongside a host of practical advice on the day to day existence of the gigging professional musician. It's all here - such as what to do if you've lost your passport in a foreign land or how to charm the caterer's into feeding the band at a society wedding..
A friend was quoting a few sentences to me from Road Rats Tips before I'd actually started reading it. "Well," I said somewhat pompously, "That's just common sense." "Oh yes? How many musicians do you know who can apply common sense?" she cuttingly replied. I had to admit that Django Reinhardt could have counted them on the fingers of one hand - either hand. Plenty going on down Yorkshire way. Apart from the Scarborough Jazz Festival which kicks off on Friday with an Afternoon Special where Gareth Williams, Dave Green and guest Enzo Zirilli pay tribute to Bill Evans and Scott La Faro, it's all happening over in Leeds courtesy of Seven Jazz. Details here. Stormy Weather felled Autumn Leaves. Hatches battened, this was Key Largo writ large but Gumshoe Bebop was determined to spend some shoe leather in pursuit of Improvisational Enlightenment. In Toon, t-shirts and mini skirts defied stair rods, seeking shelter in the next nearest gin joint, then the next. Up ahead, on the corner of Collingwood and Westgate, the Lit & Phil’s lamplight looked so inviting (in the Gallery of Imaginary Bebop Art there is a little known Edward Hopper streetscape depicting the façade of this inner-city seat of learning and self-improvement. If you haven’t seen it, it’s the one with oddball characters entering and exiting the building: the steam train buff, the U3A student, the über-cool chanteuse). The shrieking howls, squawking and sickening sobs have stopped. Dorothy is gently tending to my fevered brow assuring me I will soon feel better after a nice cup of tea and a couple of asprins. A good night's sleep, and, no, I won't have to go into the big home – providing I promise never to watch the rubbish ever again. So X-factor, it was a one off and never again, Thank you Lance Liddle for creating this sanctuary of music. An emporium of the very best in music. Due to the Met Office 'Amber Alert' severe weather warning for gale force winds and heavy rain later today, I think it's sensible to cancel tonight's VCJ session at The Corner House. Krzysztof Urbanski (alt/pno); John Pope (bs); Dave McKeague (dms). Back in the 1960s a Polish modern jazz quartet led by Zbigniew Namyslowski played a memorable session at the old New Orleans Club on Forth Banks. That was a night that subsequently became legendary and the class of the Polish jazzmen can be heard on the very rare LP recorded around that time - Lola. Despite this and since then, Polish jazz musicians haven't been at the top of my listening lists. Tonight all that changed! Tonight may well also become the stuff of legend! 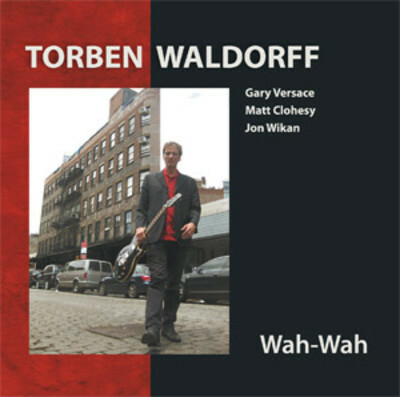 Guitarist Torben Waldorff decided that on his new release Wah-Wah it was time to leave out the saxophone and ‘take the full melodic responsibility’ for the project. The Dane has secured the services of three first rate musicians capable of meeting the challenge of his melodic and harmonic ideas. 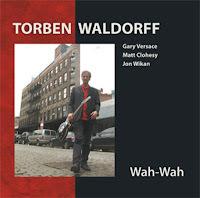 Waldorff’s new quartet features Gary Versace (keyboards), Matt Clohesy (bass) and drummer Jon Wikan. 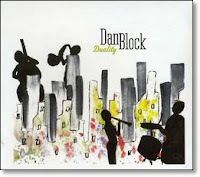 CD Review: Dan Block - Duality. Dan Block (ten/bar/clt/bs clt) and various duo partners. A duo album is always going to be a challenge and this album is no exception, However, I'm pleased to report, reedman Dan Block and his various co-pilots rise to the challenge and emerge triumphantly. It's very much an introverted performance that is also profoundly moving.- no flash bang wallop behind a thousand notes here! Rather, the overall feel is one of beauty sometimes joyous, often melancholic. Lo-fi (low-financed!) promoters A Better Noise do their thing – obscure, underground, gigs for those who can be bothered. Finland’s Taco Bells were top of the bill but more of them later. A regular night at the Chillingham. Ostensibly no stars. 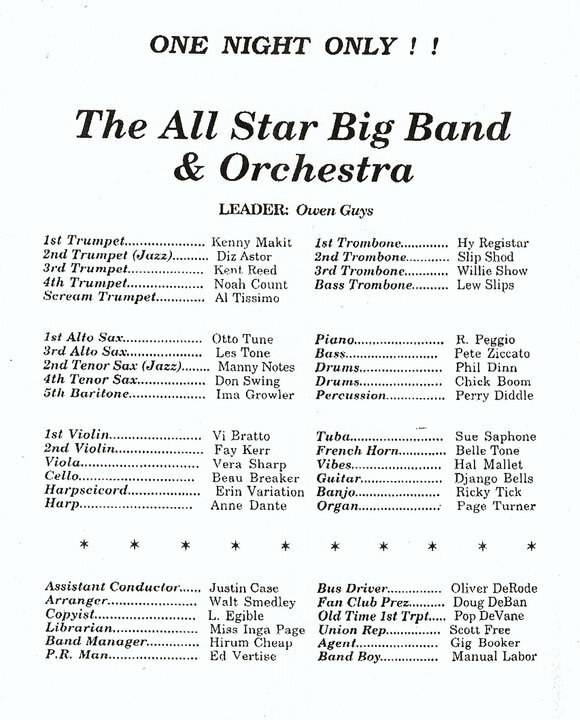 No advertised guests but plenty of star performers. Killer Joe (a regular in the pad) led by the flugelhorn of Dave Weisser, the Doris Day vehicle My Secret Love with Weisser’s vocal introduction, measured tenor by Paul Gowland and choice chords from guitarist Mike Papapavlou and Oleo (called by Papapavlou) made for yet another enjoyable set at the Chilli. Barrie Ascroft’s arrangement of Bill Evans’ Waltz for Debbie (aka Swing for Debbie) worked well and the combo cooked on Sam Jones’ Unit 7. On a sour note and I mean a sour note…the Chillingham, as a John Fitzgerald house, is noted for its quality beers. Well, let’s call this an off night. Belhaven 80 Shilling was flat, Workie Ticket (the glorious Workie Ticket) was poor, another beer poorer still, so the default beer – Guinness – saved the day (evening). It comes to something when Guinness trumps the real ales in a real ale establishment. Good session, Dave. David Gray (tmb); Tim Bloomer (gtr); Dominic Snaith (keys); Katie Trigger (bs); Robbie Houston (dms). You go into a bar - cocktails 2 for the price of 1. It's a young trendy place. There's a band playing - cool, groovy but, 'alf a mo, the front man's playing trombone! Trombone, I ask you? But, tell you what, he can 'play that thing'! 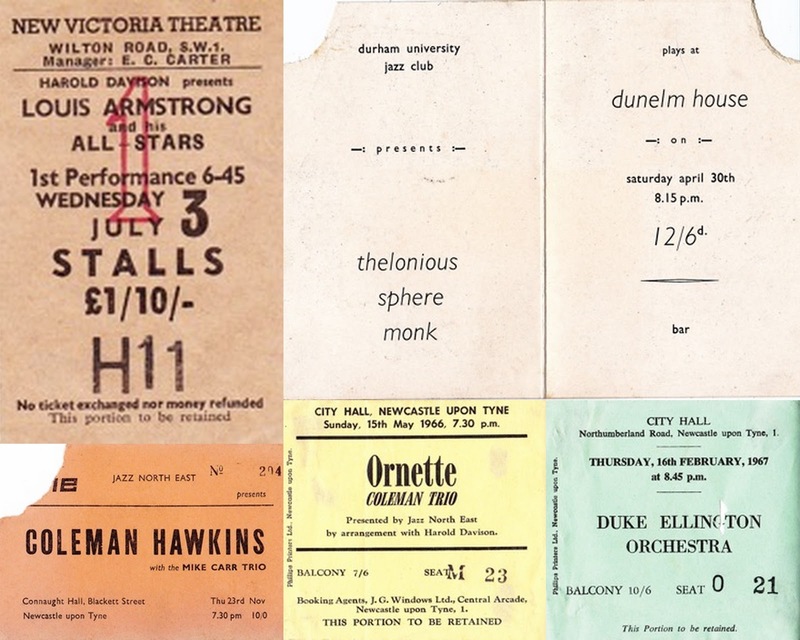 Thanks to Dr. Keith Armstrong for this collection of memories but, with the exception of Ellington and Ornette,, what years were they from? Digby Fairweather, one of our most respected jazz musicians, presenters and writers, has written a well crafted piece in the Daily Telegraph on the decline in popularity of jazz over the years pointing the finger fairly and squarely at the media and the BBC in particular. I find little to disagree with his arguments and it would be interesting to hear what others think although I'm not holding my breath. Read the full article here. I'm grateful to The Jazz Breakfast blog for drawing this article to my attention. Marian McPartland posted this great cartoon by Gary Larson on F/B which I'm sure will draw a chuckle from our readers. Thank you Marian and well done Gary - Love it!. 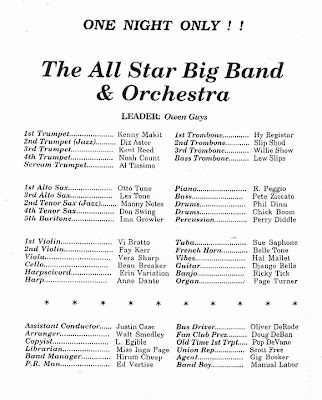 The All Star Big Band & Orchestra. Jon-Erik Kellso and Mike Barone shared this on F/B.! Steve Andrews (sax/clt) and Graham Hardy (tpt/flgl) with The Blaydon Jazz Trio featuring Jeremy McMurray pno, Andy Champion bass and Adam Sinclair drums. Steve's great playing embodies the 30s/40s swing style tenor sax of Hawkins, Young, Webster, Berry - a master player of that idiom and a wonderful, distinctive clarinettist too. For this 'one off' collaboration he joins the ubiquitous Graham Hardy (tpt/flgl), a great local player, totally at home in all styles of jazz from Satchmo to Hubbard. The meteoric rise of Roller Trio continues unabated as the Leeds twenty-somethings, described by Gilles Peterson as “…the new sound of UK jazz”, have been nominated for best jazz act at the 2012 MOBOS as well as having their debut album named a 2012 Barclaycard Mercury Music Prize ‘Album of the Year’ all within just 18 months of their first gig together. Tour includes The Cluny, Newcastle on Dec. 18. Darlington Jazz Club Looking Good! Reports are that things are looking good for the newly formed Darlington Jazz Club held in the Darlington Forum Centre early Sunday evenings 5pm-8pm. The first two Sundays are reported to have been successful and bands are booked until after Christmas. This coming Sunday (Sept. 23) features the Strictly Smokin' Big Band. DJC is not to be confused with the Darlington New Orleans Jazz Club which meets monthly on the first Saturday in the Dolphin Centre - they too have also made a good start with a visit earlier this month by the New Century Ragtime Orchestra.. It's all happening in Darlo! The above quote from "Bebop Spoken There" immediately ran through my mind as Zoe announced that 45% of the songs that she would sing tonight would be originals! I fought, and won, the battle to keep my hands as far away from my head as possible! It wasn't exactly that difficult as I'd heard several of Zoe's originals prior to tonight and knew the quality they represented even though Rodger's and Harts' It Never Entered My Mind, with the unaccompanied verse, reigned supreme. Zoe can interpret a classic lyric that compares with the best. A jazz trio from Barbados. 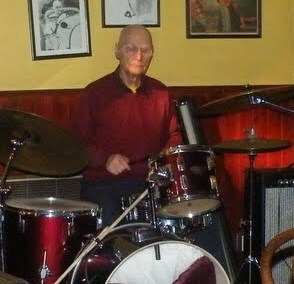 I can’t claim familiarity with the jazz scene on the island of Barbados but I do know the work of drummer David Carnegie. A few years ago on City Road in Newcastle, Dave Weisser’s Take it to the Bridge session was in full swing at the now demolished Egypt Cottage public house when in walked David Carnegie. He sat in. After a couple of bars I looked across the room to Weisser…a smile, a nod. Another great musician had announced his arrival on Tyneside (I guess this sort of occasion makes it all worth while for Weisser). Gig goers came to know David as a gentle, humble man who made a considerable impact on the music scene during his time in England. Circumstances decreed that he return to his homeland of Barbados. Jazz North East’s On the Outside programme resumed after a short summer break with veteran American free jazz musician Alan Silva working with first-call British drummer Roger Turner at the Bridge Hotel in Newcastle. The upstairs room of the John Fitzgerald hostelry has become a favourite of free players and audience alike. Silva, long-time resident in France, made his name as a bass player with legendary figures such as Albert Ayler and Cecil Taylor before abandoning the instrument in favour of the synthesizer. Science Proves That Pop Music Has Actually Got Worse. Janis Ian drew attention to this article via F/B. We've known this for years! The Wild Flower Sextet celebrates one of the greatest musicians and composers of all time, Wayne Shorter, famous for his contribution across the whole spectrum of jazz, from Art Blakey’s Jazz Messengers, through the Miles Davis Second Great Quintet and Weather Report to his new Quartet. The dynamic new sextet aims to capture some of the essence of Shorter’s approach and sound in a celebration of his music as well as with new material. 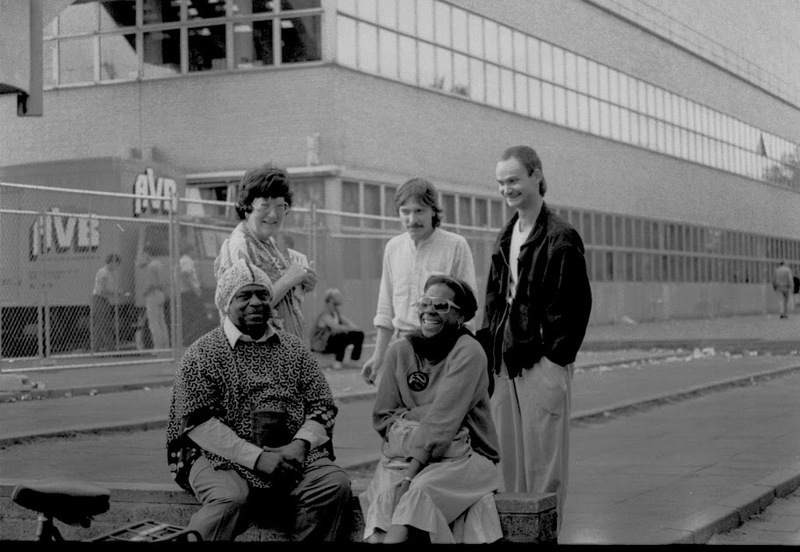 I shot this picture during one of the North Sea Jazz Festivals in Den Haag during the early 1980's. Thirty years on I cannot remember who they are. Does anyone recognise them? 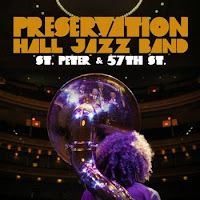 CD Review: Preservation Hall Jazz Band - St. Peter and 57th St.
Ben Jaffe (Sousa/ldr); Mark Braud (tpt); Frank Desmond (tmb); Charlie Gabriel (clt); Clint Maedgen (ten/vcl); Rickie Monie (pno); Joe Lastie jnr. (dms). No personnel given on my promo copy - only the guest artists who appeared at this Carnegie Hall concert celebrating the band's 50th anniversary so the above is an educated guess. 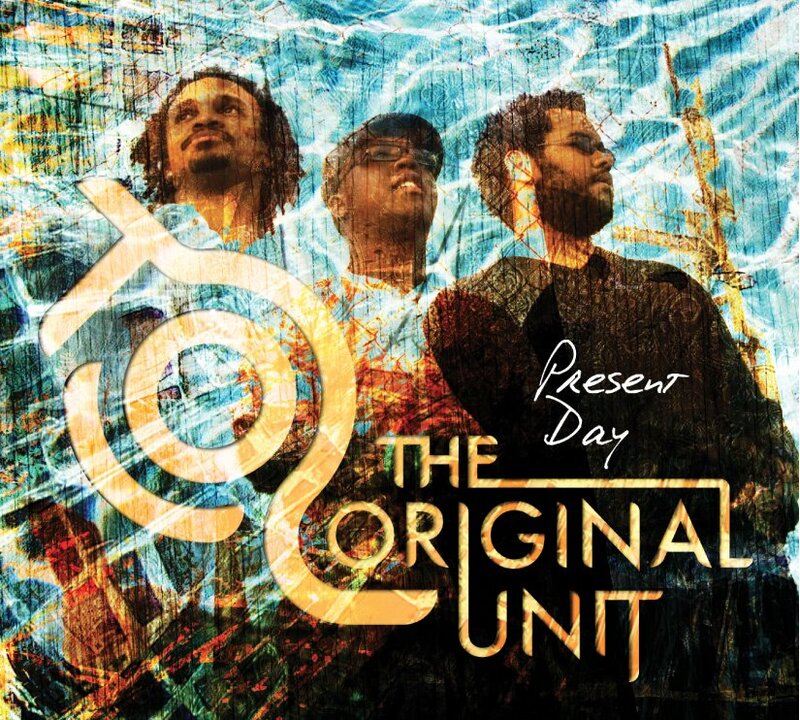 This isn't an album that would ever be played on Smooth Jazz Radio - thank goodness! It's earthy and rough around the edges but it comes from the soul and deals in excitement by the gut bucketful! Roly Veitch (vocals, guitar & banjo), James Birkett (guitar & banjo). Bebop Spoken Here covers the jazz waterfront and beyond including the north east’s legendary blues scene (jazz is blues, as someone once said) and initiatives such as Ruth Lambert’s thriving buskers’ night down at the Bell and Bucket. The Blaydon Aces are very much part of this cultural firmament. Local lad Roly Veitch plays jazz guitar, sings a song or two, runs a jazz club and does sundry other things yet somehow finds the time to research and rework the tunes of Geordie tunesmiths down the ages. Stu Findon (ten), Fiona Littlewood (ten/vcl):; Harley Johnson (keys); Tim Knowles (gtr); Jim Crinson (bs); Eric Stutt (dms). There is something about a two tenor front-line that grabs me. Tubby and Ronnie with the Couriers, Zoot and Al, Dex and Wardell, Sonny and Gene - the list goes on and tonight, Fiona and Stu added their names to the roll of honour, Plus, of course, Fiona also sings rather well giving her a head start on the others. Steve Owen is looking for any articles, information, pictures etc. 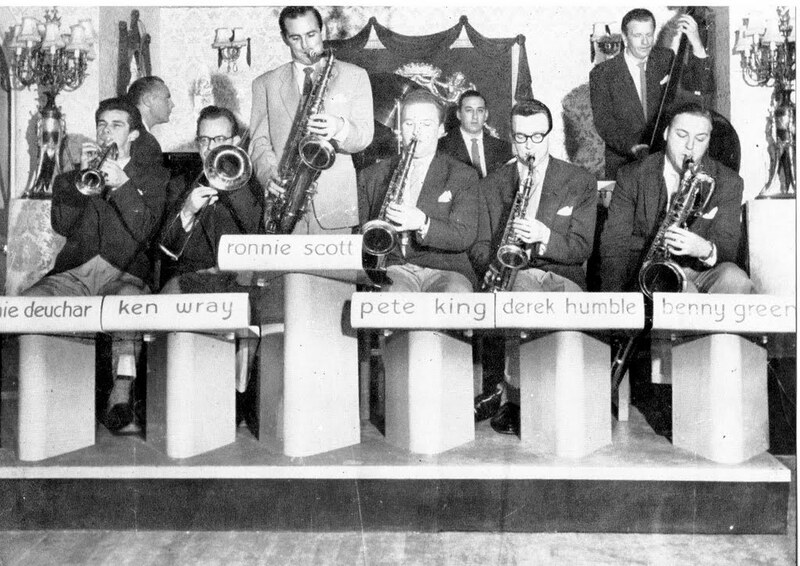 on Derek Humble a much neglected British sax player pictured here with the Ronnie Scott Band. If anyone has anything they think Steve would be interested in please let us know. Ear Training and Improvisation @ The Lit and Phil. music from Handel through to the present day. Miles Watson (tpt/vcl); Tony Winder (sax/clt); Terry Dalton (tmb); Roy (pno); Robin Douthwaite (gtr); Stan Nicholson (bs); ? (dms). There was I at a meeting with three others at the Porthole. This was about a possible jazz project, yet to be launched. We could hear the Jazz Esquires in the next room doing their stuff admirably, an enjoyable and appropriate background. Peter Morgan, MD of the Customs House Big Band even came and sold us raffle tickets which is rather like Duke Ellington doing the same at The Cotton Club. A bottle of wine (vintage late August 2012) was the prize, but we didn’t win, (weep, weep). CD Review: Yaron Herman - Alter Ego. Yaron Herman (pno); Stéphane Kerecki (bs); Ziv Ravitz (dms) + Logan Richardson (alt); Emile Parisien (sop/ten). 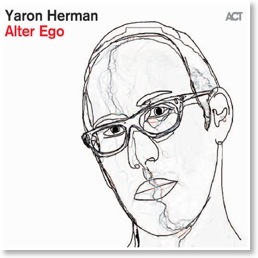 Born in Tel Aviv in 1981 Yaron Herman looked to be all set to have a career as a junior basketball player on Israel's national team. When that dream was shattered by a knee injury, Yaron, 16 year old, turned to the piano - well you would wouldn't you? - studying the instrument using a method based on Philosophy, Mathematics and Psychology. He's now considered, worldwide, to be one of the outstanding talents of his generation. At the Customs House on Friday 21st we have the West Jesmond Rhythm Kings playing their hot 1920s jazz, featuring a programme called "Mamas & Papas" - every tune has the words Mama, Papa or Baby in the title! This makes for an interesting selection, mixing the familiar with the relatively rare numbers from the classic jazz era. On this occasion, the WJRK (now in their 30th year) are reinforced by brilliant young local pianist Paul Edis. 8.00pm in the Daltons Room, Box Office 0191 454 1234 or book online at www.customshouse.co.uk (check out the pre-jazz meal deals in the Green Room restaurant - delicious!). By way of contrast, Trinity Jazz presents the 12-piece New Century Ragtime Orchestra on Saturday 22nd, at the new earlier start time of 7.30pm. The NCRO, under the musical direction of Dave Kerr, will play their customary programme of jazz and hot dance music from the 1920s and early 1930s, all lovingly taken from the original recordings of the era and played with great authenticity. An added bonus is the witty commentary by MC Steve Andrews, who also plays great sax and clarinet. Guaranteed good fun and super music! Box Office 0191 285 6130, advance booking recommended as this excellent band frequently draws capacity audiences. Earlier this year Ron Guariento informed me of his proposed Course on the Great American Songbook (The Gasbook as we affectionately call it) and appealed for interested parties to get in touch. Well I'm pleased to say that many parties were interested and the course, which starts on Oct.16 for 5 weeks, is now fully subscribed. However, if you've procrastinated and missed out, Ron is hoping to run another one next year looking at songwriters and lyricists other than the "Big Five". Jazz Jam Sessions: A First-Timer's Guide. Alan Law came across this amusing, albeit lengthy piece, on all about jazz by Bill Anschell. 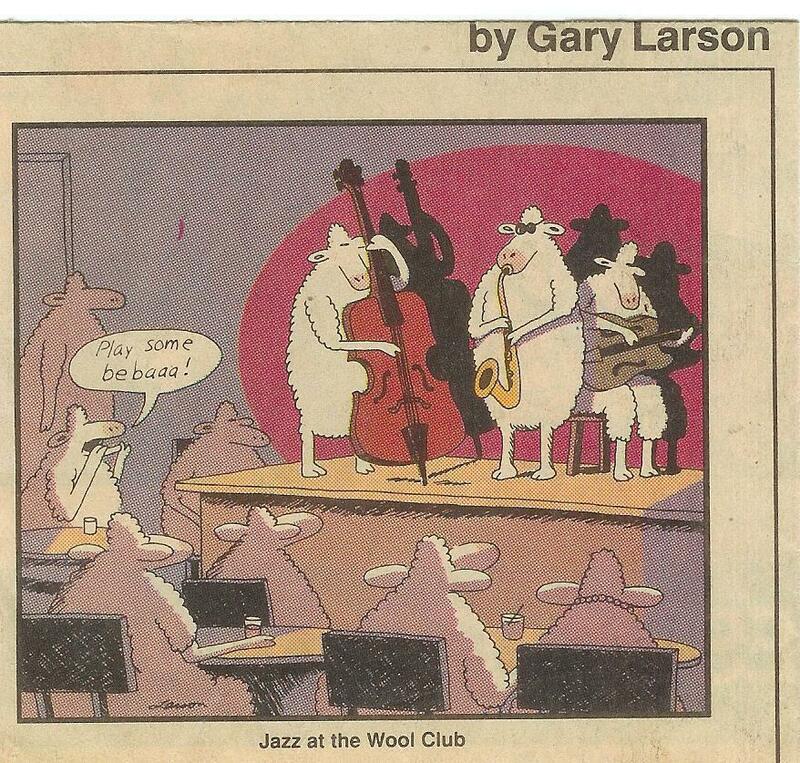 Entitled Jazz Jam Sessions: A First-Timer's Guide it has quite a few belly laughs. Dr. Rock (I kid you not) interviews Mike Gordon, organiser of the forthcoming Scarborough Jazz Festival, on Radio York. Click here to catch some samples of what to expect at the Festival which runs from Sept. 28 - 30. The link is valid for 6 days..
PS: Herbie Mann, the opening track, isn't at Scarborough and it isn't Herbie Mann it's King Curtis! Anna Hughes and Sarah-Ellen Hughes Big Band at Ruislip Social Club. John Warren (cond./comp./arr. ); Julian Siegel (clt/sop/ten/cont bs clt); Graham Hardy, Sean Eland, John Dunn, Greg Nicholas (tpts); Chris Hibbard, Alex Leathard, Kieran Parnaby, Eddie Bellis (tmb); Rod Mason, Andy Bennett, Graeme Wilson, Sue Ferris, Niall Armstrong (reeds); Stu Collingwood (pno); Mark Williams (gtr); Andy Champion (bs/bs gtr); Adrian Tilbrook (dms). Friday, I vote for the VOTNJO in the Big Band section of the British Jazz Awards, Sunday, the grim reality that this was to be their final concert - at least under John Warren - sinks in. So perhaps we should all vote for them in appreciation of what they have achieved over the past 15/16 years. The music is complex - a jazz version of say Berlioz' Symphonie Fantastique - but it's also accessible to all but the most tunnelled visionaires. 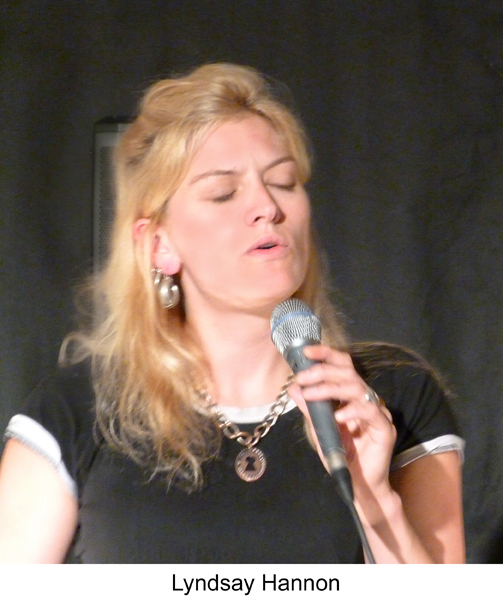 Lindsay Hannon Plus @ Ashington Jazz Club. Wednesday Sept. 5. Lindsay Hannon (vcl)' Alan Law (pno); John Pope (bs); Mark Robertson (dms). As a regular reader of Bebop Spoken Here I have not only come to acknowledge the Editor's intimate knowledge of Jazz and Jazz Musicians but over a number of years I have come to respect his views and opinions about the Jazz Scene in the North East. Lance is the founder of an inspirational web site. I therefore usually agree with his learned comments and found this to be so when AJC welcomed the Lindsay Hannon Plus group at our September meeting. The members experienced a fascinating and varied selection of melodies and lyrics and our musical appetites were well nourished. Tonight at The Sage Gateshead - Not to be missed! Since its creation 15 years ago, the Voice of the North Orchestra has grown into perhaps the most exciting big band anywhere in UK jazz. 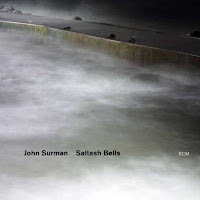 Whilst it has the drive, swing and precision of the great big bands of the past, it has been determinedly forward looking in developing its own original repertoire, much of it contributed by the internationally acclaimed composer and arranger John Warren, who has been the band’s Musical Director throughout its life. This will be the last appearance of Voice of the North Orchestra with John Warren as musical director, so this is a real chance to celebrate the great musicianship and work from the last 15 years. 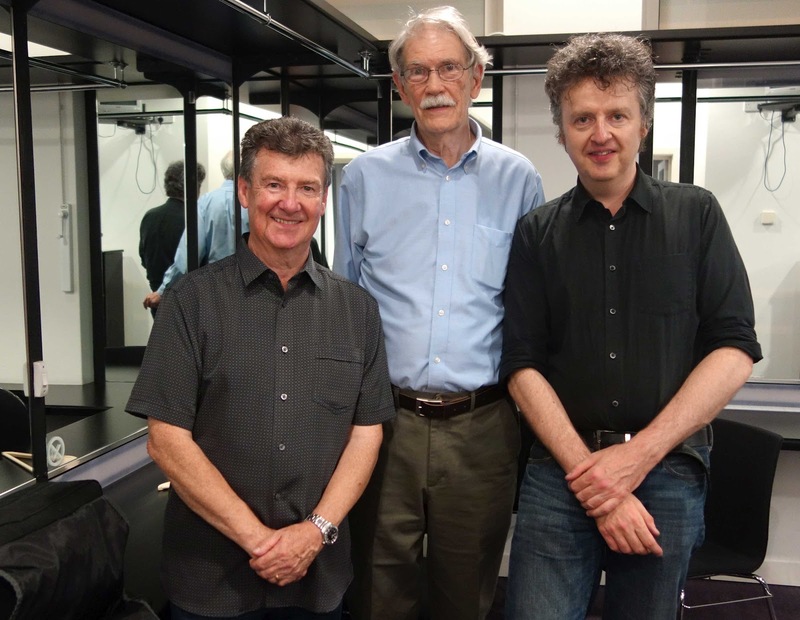 This performance is also a culmination of a collaboration project with Julian Siegel and will feature a specially commissioned suite plus other repertoire. This was my last chance to try this event before my regular Thursday commitment starts again, and I certainly enjoyed myself immensely. It’s not a jazz do so I’ll be brief, but it’s highly recommended for anyone with wide musical tastes. There was a plethora of rock-type guitarists doing allsorts, Bowie’s Space Odyssey; an unusual take on a Supremes song; various rock numbers which I wish I could remember; an Elton John-like keyboardist; a guitarist who jumped and danced as he played songs which may have been self-penned, one about the terror of spider’s legs, the other a love song to Julie. A supremely confident female singer gave us a Carole King song and the evocative KT Tunstall song about the Black Horse and the cherry tree. Even myself, with Ruth on Guitar, singing Autumn Leaves and Summertime - although I didn't have my D whistle with me as pictured in the photo! There must have been at least a dozen performers, but Ruth said this was a quiet night! The pub is cosy, with a raised section for performers and keen listeners, enhanced by many photos of owls, which made me feel wiser than I really am. Ruth runs a great night by welcoming and encouraging all comers, organising the sound system, and, of course, opening the night with her own jazz singing, and rounding proceedings off with Hit The Road Jack, accompanied by a certain Mr Lambert on excellent jazz guitar. Definitely worth a visit, and, as they say, take your axe along as well. Vote in the 26th British Jazz Awards. It's time to vote in the 26th Jazz Awards organised by Big Bear Records and Jazz Rag magazine. Polls are good fun and have advanced from the days when Tommy Steele was, reportedly, voted ahead of Barney Kessel in the guitar section of a Melody Maker Poll! On October 27, the winners will be presented with their awards at the Concorde Club, Southampton which lays claim to being the oldest jazz club in Britain having been going since 1957. 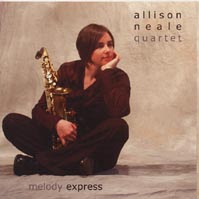 CD Review: Allison Neale - Melody Express. Allison Neale (alt/fl); Dave Cliff (gtr); Simon Thorpe (bs); Matt Skelton (dms). Hardly a hot off the presses CD - it was recorded 10 years ago and released in 2004. For all I know it's a collectors item now. If it is, then start searching because this is one of the most delightful discs I've heard in years. Pete Gilligan's Jam Session @ Hoochie Coochie. Thursday Sept. 6. Pete Gilligan (pno); Steve Glendinning (gtr); Paul Susans(bs); ? (dms). + Lindsay Hannon (vcl); Gabriele Heller (vcl); Steve ? (ten). Plenty of variety of styles and overall a highly entertaining night. If this is a regular jam session please give us more Warren! A lovely lady with a top notch camera took lots of pics. I gave her Lance's email address - hope we can see her work some time. Numbers were down at Hoochie last night, I know that some folks would be at Blaydon but numbers seem to be down everywhere at the moment - we only had 30 at Ashington on Wednesday. CD Review - Vitor Pereira Quintet: Doors. Vitor Pereira (gtr); Chris Williams (alt); James Allsopp (ten); Ryan Trebilcock (bs); Eddie Hick (dms). 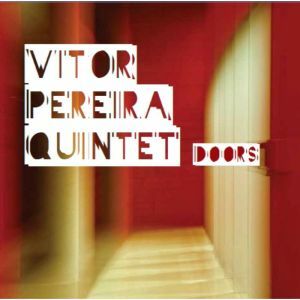 An impressive, if somewhat varied, début album from Portuguese guitarist Pereira, who composed all 8 tracks, taking in many moods and genres. Coffee Break begins in a civilised manner as befits the title but soon erupts into a scalding espresso with all participants at boiling point before cooling down. Grecian God of Tenor @ Blaydon - Vasilis Xenopoulos with the Paul Edis Trio. Vasilis Xenopoulos (ten); Paul Edis (pno); Mick Shoulder (bs); Adam Sinclair (dms). Amazingly there were empty tables at the front of the stage! Every sax player within walking, biking, bus-ing, driving, swimming, parachuting, distance should have been here. Likewise, pianists, drummers and bassists. You guys think you can learn it all at college or by listening to downloads? Get out and around the gigs - tonight would have got you there in 15 minutes on the number 11 bus from outside of the Central Station. The sad thing is, you'll never know the pleasure your apathy caused you to miss and maybe you'll wonder why nobody comes to your gigs. Search for best unsigned blues musicians goes nationwide - musicians from across the country urged to enter now!! It has just been announced that entries for this year’s highly prestigious and UK-wide competition – The New Brunswick Battle of the Blues - will open on 1st October 2012. For a third year the cream of unsigned bands and singer/songwriters is being sought from across the UK. Well I'm watching Mrs Biggs on ITV and so far so good. Opening with Take The A Train - what else? - the soundtrack includes plenty swing. I think I'm going to enjoy this. CD Review – Kurt Elling 1619 Broadway, The Brill Building Project. 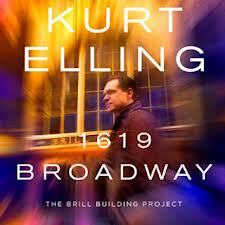 Kurt Elling (vocal); Probably Laurence Hobgood (Keys/Arranger); ? (Sax); Ulysses Owen Jnr. (Drums); John McLean (Electric Guitar); Clark Sommer (Bass). 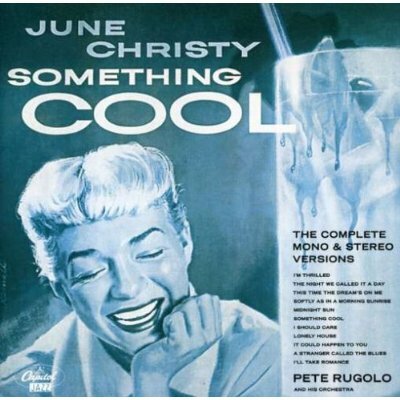 This CD, release date 1st October 2012, features (I quote) renditions of classic songs that came out of the Brill Building (Manhattan), from an array of renowned songwriters including Burt Bacharach, Paul Simon, Jerry Leiber and Mike Stoller, and Carole King. Indeed, it was in the Brill Building that Bacharach met the lyricist Hal David who passed away last week. A House is Not a Home was one of the many hits the duo wrote and it is sung in Elling’s distinctive style. Roly Veitch forwarded me this intriguing, albeit somewhat misleading, link. Bill Evans Plays Banjo. This slants a whole new light on the opening concert of this year's 10th annual Scarborough Jazz Festival - GARETH WILLIAMS and DAVE GREEN play BILL EVANS and SCOTT La FARO! Which reminds me that the big weekend by the sea is now only 24 days away. My bucket and spade is already packed - bucket for the beer and spade for the chips. The tragic death of trumpet player Abram Wilson in June left a massive gap to fill on Saturday afternoon's programme and possibly the Jay Phelps Quartet is the only trumpet-led group that could do it. Jay will pay a musical tribute to Abram that should be both emotional and yet joyous as we remember the good times listening to the late trumpet man. PS: As a special treat the James Birkett Trio will be playing in the bar during the festival. Sassafrazz @ The Cherry Tree. Siobhan Stanley (vcl); Mark Deeks (pno); Peter Morris (bs); John Forster (dms). Sassafrazz, I suspect is a new band although no doubt they are all seasoned professionals - perhaps as seasoned as my Warm Salad of Confit Duck and Chorizo Sausage with which I started the evening. I missed the first number just as Siobhan "Missed the Saturday Dance" which she struck up with as I arrived. Well, just as they "Crowded the floor" in the song so did the diners crowd the tables both upstairs and down. It was a very good turn out although it has to be said that this was in part due to pianist Mark Deeks who, in a parallel universe, is involved with the Inspirational Choir at The Sage and several of his choristers had come along in support - I don't think they would have been disappointed. Ian Forbes breaks wrist in car accident. Ian Forbes (pictured left) has been in a car accident and suffered a broken wrist. This means he is temporarily out of action. We send our best get well soon wishes. It has certainly been a great pleasure for me to have spent the last few weeks giving repeated listening to one of the new ECM recordings that is Saltash Bells by John Surman. I would however say that it is certainly one that presses the inevitable question of how well can you actually put into words a series of such spacious and free spirited musical compositions, for indeed music surely is it’s own language. She fought long and hard but sadly, she lost. The death was announced yesterday of blues singer Maggie Ross - one of the finest blues gals around the north-east and indeed anywhere. Facebook had been overflowing with support for Maggie who only 10 days ago was interviewed on Look North. The tributes on the social network site have started and there will be a deserved deluge. Only this morning I received an email from Anne (DeVere) Harper which gives an indication of the love Maggie inspired. Hi Lance, don't know if you caught Maggie on 'Look North' last week. I worked with her at the Mayfair in the 80's. She has a huge following in the R&B venues and has a big voice for such a cutie. She has terminal cancer and if you track her on Facebook you can see all the posts--tragic as she was so vivacious and loved by all. The lass will fight to the end!!! Love Anne. 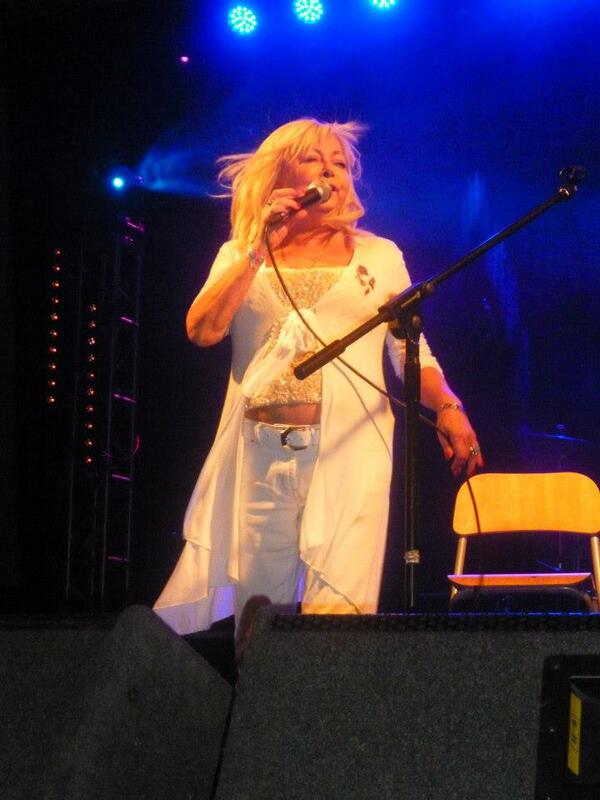 Listen to Hoochie Coochie Woman recorded less than a year ago at Stockton. Lance. (Photo by Amanda Morgan). 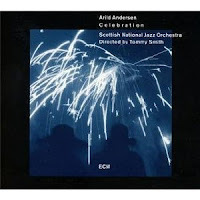 I've been spending a bit of time listening to the Arild Andersen ECM 40th anniversary Celebration album recently and it’s not hard to recognize that you are listening to musicians of an exceptionally high standard playing at the top of their game. Band leader Dave Kerr, Steve Andrews (tenor saxophone, clarinet & vocals), Gavin Lee (clarinet & tenor saxophone), Alan Marshall (clarinet, alto saxophone & flute), Jim McBriarty (clarinet, alto saxophone & vocals), Graham Hardy (trumpet), Alistair Lord (trumpet), Don Fairley (trombone), Keith Stephen (banjo & guitar), Emma Fisk (violin), Neville Hartley (piano), Phil Rutherford (sousaphone) & Steve Doyle (drums). Darlington New Orleans Jazz Club has a new home. The closure of Darlington Arts Centre precipitated a move across town to the Dolphin Centre in Horse Market. The Arts Centre was a favourite of many a jazz fan and it remained to be seen how many would transfer allegiance to the council-run sports centre. A white-walled room, suspended ceiling tiles and windows lacking curtains or blinds made for a functional office setting. High back chairs in rows, one or two tables at the back of the room – one needed somewhere to rest a pint of Guinness – and things were set fair. 2 LONDON, Purcell Room, Southbank Centre. 7.45pm. £20 - 0844 875 0073. 3 BURY ST EDMUNDS, The Apex. 8.00pm. £16 - 01284 758000. 4 BRISTOL, St Georges Bristol. 8.00pm. £21 - 0845 40 24 001. 5 SOUTHAMPTON, Turner Sims. 8.00pm. £18 - 023 8059 5151. 7 MUCH WENLOCK, The Edge Arts Centre. 8.00pm £16, £14 - 01952 728911. 9 LEEDS, The Venue, Leeds College of Music. 7.30pm £15 - 0113 222 3434. 10 MANCHESTER, Royal Northern College of Music. 7.30pm. £17, £14 - 0161 907 5555. Shame Newcastle isn't in there! However if you read Dave Brownlow's review again you may want to buy the CD! Prom 59 - The Broadway sound. After missing out on Seth McFarlane at Ronnie's on Thursday I decided to watch tonight's Prom which featured, among others, Seth with John Wilson's Orchestra. Hearing Seth backed by the Geordie André Rieu is somewhat different to hearing him backed by the Ronnie Scott Jazz Orchestra - I wish! Nevertheless, he is a man for all seasons and he coped well on Sue Me from Guys and Dolls as well as the other numbers. A few jazzmen kicking around the orchestra. Matt Skelton on drums and I think that could have been Mark Nightingale among the trombones. Away from Seth, I liked Anna Jane Casey's Don't Rain on My Parade. AJC also led the team of dancers in the encore which was a splendid tap routine. It's good to see The Proms expanding its horizons - the NYJO and Martin Taylor's Spirit of Django concerts were excellent. Tonight wasn't a jazz night but there were some nice moments for those of us who believe a song doesn't have to be decimated into a hundred choruses to be enjoyed! Personally I enjoy both the decimated and pre-decimated versions of the popular song. CD Review - Graham Dechter: Takin' it There. Graham Dechter (gtr); Tamir Hendelman (pno); John Clayton (bs); Jeff Hamilton (dms). A must for guitar buffs! 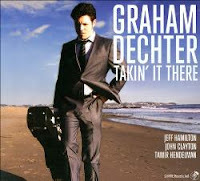 Graham Dechter, a young guitarist from Los Angeles, lives up to his hype as being poised and polished, suave and swinging - he is all these things and more. Both Dechter and pianist Hendelman paid their dues in the Clayton Hamilton Jazz Orchestra and it is fitting that the co-leaders of that orchestra complete the quartet here. The last in the summer series of gigs on the concourse featured a band of student musicians led by the impressive pianist James Harrison. Originally billed as the Henchmen Sextet, on arrival the poster at the door said 6 and 2 Three’s Sextet (sic). Was this the same band with a sudden change of name? The acoustics in the cavernous space don’t help musicians at the best of times and on this occasion, despite the assistance of a sound engineer, the sound balance was poor and PA announcements left an awful lot to be desired.